Get the most from your technology! With unemployment at record lows, maximizing the use of your technology is as important as ever. This edition of our newsletter focuses on getting the most out of your AGTEK system with insights into new features, helpful resources and details on upcoming training programs to get new users up to speed fast and experienced users’ working more efficiently than ever before. AGTEK is offering two intensive hands-on training courses each month in our Livermore, CA facility. Users can sign up for all 3 days or select individual training days. The Hands-on Takeoff Training course covers earthwork takeoff from PDF and CAD files in Day 1 and 2. Day 3 covers takeoff for highway, paving and pipe. The Hands-on Training for Modeling & Production Control covers managing the GPS model, measuring progress from drone topos and monitoring job-site efficiency and effectiveness from machine tracks. AGTEK recently hosted a popular webinar on Basic Earthwork Takeoff from CAD providing insights in getting from the CAD model to a takeoff with simple tips and tricks to get you there fast. Past webinars include Basic Takeoff from PDF, Measuring progress topos with drones, Fundamentals of Earthwork Takeoff and Seven Secrets to Speed Takeoff. Click here to visit our website to replay the webinars at your convenience. AGTEK has an extensive library of training online videos to train yourself at your own pace, review concepts and learn basic to advanced functionality as your skills grow. Click the desired program, then choose the topic. You can sign up for training via the internet and complete your one-on-one training from the comfort of your own office. All that is required is the AGTEK software you wish to be trained on and a high-speed internet connection. Our highly experienced staff will guide you through every step of the way. Online training is ideal for new users or experienced operators wanting to get more out of the latest functionality. Authorized independent AGTEK training classes are also available via local seminar-style classes across the country. There are many reasons for additional learning and continual development in today’s construction environment, whether it is getting a new user up and running fast or learning new techniques to keep projects moving along as planned. We provide a host of formats to help you get up to speed quickly and enhance your skills with the AGTEK product suite. The latest version of Earthwork 4D, (available here) has consolidated all data exports to the File > Export menu. The export now includes files for mobiles apps, KMZ and ADF, as well as machine control data for Leica, Topcon and Trimble. The previous version, most of the data exported was from the File > Save As window. This window will now only save AGTEK job files (ESW, ESZ). All other data exports are in the Export menu. 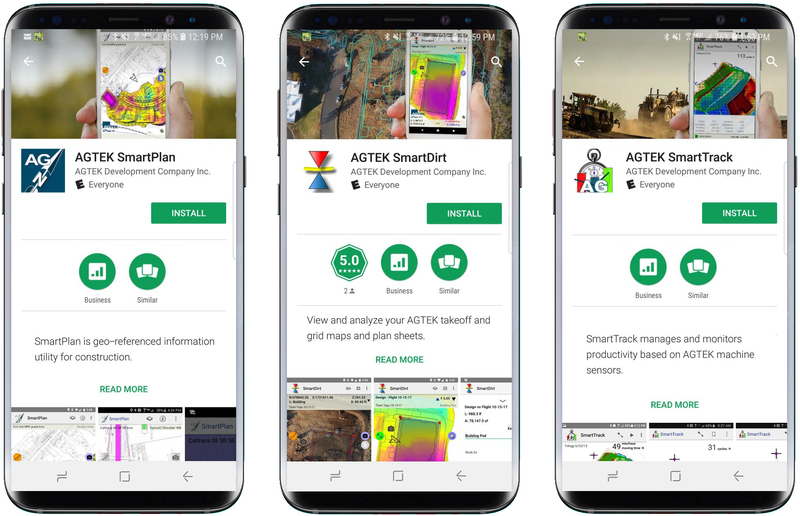 In the latest version of Earthwork 4D, visibility controls are now available when exporting files to AGTEK's mobile apps SmartPlan and SmartDirt, along with data exported to a CAD file for machine control. When exporting a KMZ, ADF or DWG/DXF file. you may now include layers in the file, and control the visibility of the view when opening the file. If the layer is checked, turn off the visibility by clicking the eye beside the layer name. A red slash will indicate the layer is hidden when opening the file in your mobile apps or machine control systems. The Export dialog windows may also be resized to accommodate the plan sheet and layer names. AGTEK mobile apps for Android devices may now be downloaded from the Google Play Store. Search for AGTEK to locate the mobile apps SmartPlan, SmartDirt and SmartTrack. New users may download the apps for the initial installation on the device. We recommend current users also visit the store to install the current version. All future updates will automatically update from the Google Play Store simplifying the update procedure. Apple iOS users will find the mobile apps on the Apple Store. Follow AGTEK on Social Media . . .
Stay connected with AGTEK using social media, including Linkedin, Facebook, Twitter and Instagram. To follow AGTEK on LinkedIn, click here, or click here to join the AGTEK Users Group. Visit our website at www.agtek.com and select the desired media of your choice. Click here to view a video demonstrating all the new features in version 1.20. Open the program and Select Help>About Program Name from the menu. How do I get the latest versions? The latest version of the AGTEK software is available on the Support - Downloads page of the AGTEK website. Click the Download button and save the file to a known location. After the download is finished, double-click to start the installation program. Follow the installer directions to completion. A backup copy of the download can be saved for future use. All AGTEK support subscribers can access the latest download at any time to take advantage of new features and enhancements. If you are not an AGTEK support subscriber, please click to ask for more information.